There's something about a sandy beach, crashing waves and the shade of a palm tree that brings out the romantic side in just about anyone. 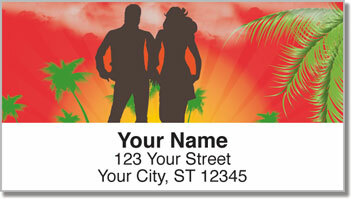 These colorful return address labels feature silhouettes of happy couples on a dreamy vacation. 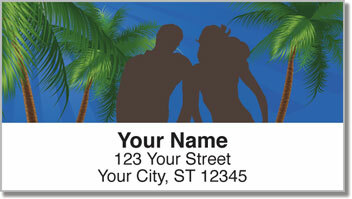 They're a great choice for labeling invitations or Thank You cards if you have a destination wedding. Or you can send letters to friends and family letters from your honeymoon. 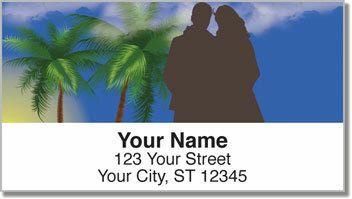 Romantic Hideaway Address Labels from CheckAdvantage are 100% original. Plus, they will save you a ton of time when preparing outgoing mail. Just peel and place them on every envelope! 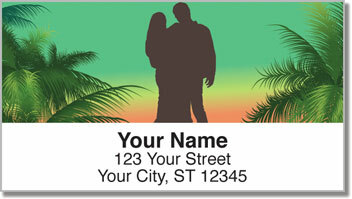 Make Romantic Hideaway Address Labels yours right now! This design can also be ordered as matching personal checks.